We noted in the first part of this four-part series that the Convair Super Hustler had to be small because it was to be launched from below a B-58 Hustler. It had to be fast to deliver its payload without being intercepted. And it had to fly high to reach supersonic speeds and to avoid detection. Small, fast, and high-flying were characteristics that also made the aircraft a logical candidate for a reconnaissance platform to replace the Lockheed U-2. The secretive U-2 took to the skies for the first time in the summer of 1955, flying at altitudes above 70,000 feet to avoid detection. Even at those heights, however, the U-2 was picked up and tracked by ground-based radars on its earliest operational mission over Eastern Europe in the spring of 1956. Nonetheless, the United States continued to use the aircraft through the late 1950s to collect valuable intelligence on the military capabilities of the Soviet Union and the other Warsaw Pact countries. Since becoming operational, the U-2 aircraft has continued to function as the premier reconnaissance platform for the United States. Lockheed, with the assistance of Lincoln Laboratory at the Massachusetts Institute of Technology, attempted to address the U-2’s susceptibility to radar detection with coatings and external structures in Project Rainbow initiated in August 1956. The project was unsuccessful and was cancelled in May 1958. Even before Project Rainbow, the US Air Force funded some U-2 successor studies as early as 1955. However, none of these studies showed promise. The CIA, the original customer for the U-2, took up the challenge in the fall of 1957 when it initiated its own U-2 successor program. Richard Bissell, project manager for the U-2 at the CIA, led the effort. Lockheed and Convair were invited to participate in the classified program. Bissell enlisted the Land Panel to act as a scientific advisory board to help evaluate aircraft proposals. The panel was named after its chairman, Edwin Land, founder of the Polaroid Corporation. Lockheed’s efforts led to a series of design configurations called Archangel. Convair’s efforts led to a design called FISH—short for First Invisible Super Hustler. While no design for a reconnaissance version of the Super Hustler was completely invisible, early versions were more visible to radars than later ones. FISH origins can be traced to a standard version of the Super Hustler with cameras and sensors added to the front section of the aircraft. The variant was presented to the Air Force in May 1958. The equipment on the Super Hustler included an ultrahigh-resolution camera located just behind the nose wheel compartment that provided up to 5,500 nautical miles coverage. A high-resolution X-band radar located in the next compartment provided a range of fifty nautical miles and a resolution of 200 feet at twenty nautical miles. The compartment also contained a scanning radar with a range of 180 nautical miles. A data recorder, added to the compartment behind the cockpit, collected information from both radars as well as video from the television camera in the nose. The range figures for the reconnaissance version were about 8,000 nautical miles for a composite aircraft, which consisted of a manned stage and a booster. The manned stage alone had a range of 5,400 nautical miles. Operating speeds and altitudes were the same as for the Super Hustler (Mach 4 and 80,000 feet). This reconnaissance version of the Super Hustler accounted for about five pages of a much larger report that addressed various uses and basing strategies for the Super Hustler. Reconnaissance soon became a primary focus for the Super Hustler. When it was formally presented as a preliminary study for the US Air Force—not the CIA—in September 1958, the aircraft was initially called the Special Purpose Super Hustler. This variant of the Super Hustler was a single-stage aircraft. That is, the design deleted the unmanned ramjet-powered booster stage that carried the nuclear payload planned for the standard Super Hustler. Removing the booster stage allowed the manned stage to be stretched thirty-six inches. Not only did this additional space make room for more fuel in the main fuselage, but it also made room for either a photoreconnaissance package or a signals intelligence package in the nose. The Special Purpose Super Hustler featured updated navigation system and larger ramjet engines. The design gave an option for replacing one member of the two-person crew with a large vertical camera. The photoreconnaissance package offered two options. The first option consisted of one large panoramic camera with a twenty-four inch focal length. At the aircraft’s cruising altitude of 90,000 feet, the camera could cover an area of thirty miles by 1,500 miles while producing individual images measuring nine inches by thirty-eight inches. The second option, called a dual-purpose photoreconnaissance installation, consisted of three smaller 2.25-inch square format cameras (three-inch focal length) designed to locate targets and one larger 4.25-inch by eighteen-inch panoramic camera (twelve-inch focal length) designed to collect technical intelligence. The signals intelligence package, called a ferret reconnaissance system, was designed to detect and locate radar and radio stations and to analyze signals produced by those stations to determine the order of battle intelligence—basically, how an adversary would respond electronically to an attack. The package had modular, removable units and flush-mounted antennas. The initial design avoided detection from threat radars by operating at high speeds and high altitudes. Radar cross section was addressed by the aircraft’s small size and by its flat bottom (even though the inlet was on the lower fuselage). The presentation included a size comparison to the proposed B-70 and the existing B-52 to emphasize the advantage of the Special Purpose Super Hustler’s small size. Its small size and operational altitude also reduced sonic booms, which were predicted to be around 110 decibels at Mach 4 as measured at sea level. The gross weight of the initial Special Purpose Super Hustler was 31,200 pounds, which included 18,750 pounds of fuel. By comparison, the gross weight for the manned stage of the two-stage Super Hustler was 20,190 pounds, which included 11,070 pounds of fuel. 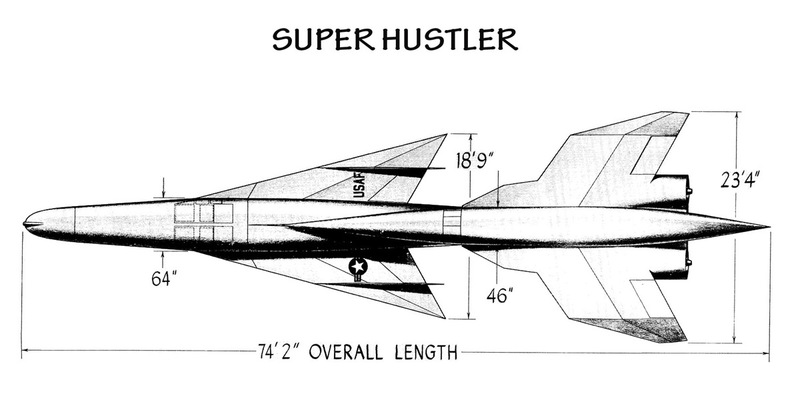 The Special Purpose Super Hustler had a cruise speed of Mach 4, a maximum altitude of 90,000 feet, and a range of 4,500 nautical miles. A month after the preliminary study was presented to the US Air Force, Convair was asked by Richard Bissell to exploit the reconnaissance capabilities of the Super Hustler concept. The request resulted in a Special Purpose Super Hustler Feasibility Study that was presented to the Land Panel for initial evaluation on 11 November 1958. The study included two basic aircraft configurations. The first configuration, called a minimum change configuration, had a wing area similar to the previous special-purpose design. However, the wing’s leading edges were slightly curved outward to lower the radar cross section of the aircraft. Wing length was 28.1 feet; wingspan was 19.8 feet. The second configuration had much larger curved wings with wing length of 38.0 feet and wingspan of 34.2 feet. 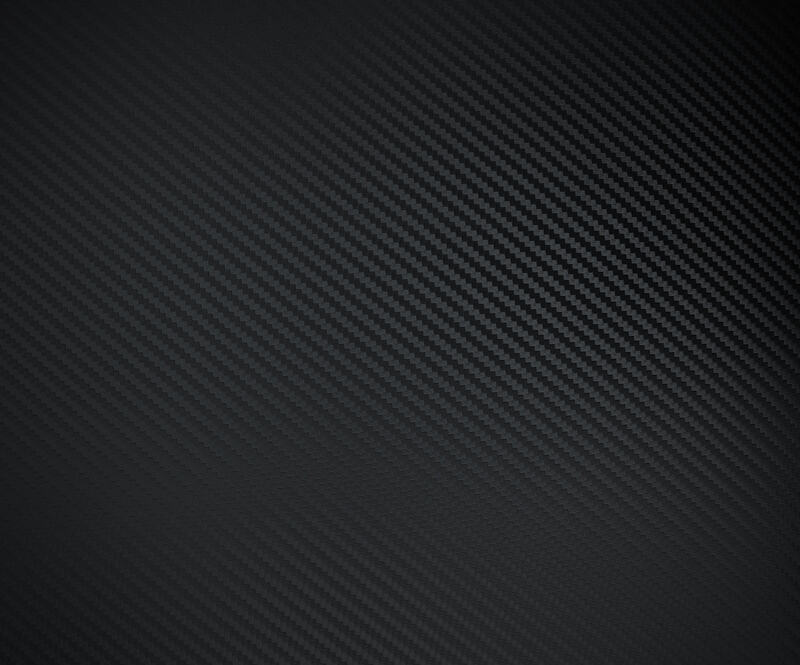 This second configuration became the recommended configuration. The recommended configuration was refined and labeled Configuration 220. By December 1958, the design was 48.8 feet long and 8.7 feet tall. It had a gross weight of 35,000 pounds and an empty weight of 15,300 pounds. Like the Super Hustler, this early version of FISH had a nose tip that hinged downward and tucked below the fuselage to deal with the space limitations of the B-58 carrier. (The nose could be swung up after the landing gear of the B-58 was retracted.) The aircraft was powered by two Marquardt MA24E ramjet engines with 41.5-inch diameter variable-geometry exit nozzles. A Pratt & Whitney JT12 series turbojet engine was nestled between and just in front of the ramjets. A bifurcated intake on the lower side fed both ramjets and the turbojet. Two landing vision arrangements were outlined in the study. The first had the same droop nose design used on the Super Hustler in which a hinge just behind the canopy tilted the forward section of the aircraft downward eleven degrees so the pilot could see over the nose of the aircraft for landings. In this configuration, the one-pilot crew sat thirteen inches to the left of the aircraft centerline to make room for a fuel tank on the pilot’s right. Insulated metal covers protected the flush-mounted canopy glass from the high surface temperatures produced by flight at Mach 4. The second landing vision arrangement was more standard, with a protruding canopy structure allowing the pilot vision over the nose. In this configuration, the pilot sat on the centerline. The canopy glass consisted of three layers: the outer layer was a silica glass; the middle layer was a radiation shield; and the inner layer was a conventional laminate. This more standard arrangement was further refined in March 1959 as Configuration 226. The mission profile for the initial versions of FISH involved launching the aircraft from the B-58 carrier at Mach 2.2. FISH would then climb and accelerate to Mach 4 in three minutes. In about another minute, the aircraft would reach its 90,000-foot cruising altitude where it would cruise at Mach 4 for about forty-nine minutes, turn 180 degrees in about nine minutes, and then cruise back to its home base for another forty-two minutes. The descent took the aircraft from Mach 4 to Mach 0.4 in approximately twenty-two minutes. The 4,150 nautical mile range did not include 216 nautical miles of fuel reserve on the turbojet engine. High-energy fuel containing a boron compound added another 1,000 nautical miles to the range. Flight control was made possible by two elevons, two vertical fins, two rudders, and the nose tip that could be deflected for trim control. Detection performance was presented in four sections—radar, infrared, contrails, and sonic booms. The radar cross section tests were the most extensive, involving sixty different models with variations in fuselage configurations, wing planforms, vertical fin configurations, notching techniques, and engine exhaust shields. These tests were done with 1/46-scale models. Radar cross section tests were also done on full-scale models of the engine inlet with two different inlet screen types. Radar cross section results were presented as polar plots of radar cross section (radar return intensities measured on a complete 360-degree circle around the aircraft). The program schedule called for twenty aircraft, with the first flight planned twenty-seven months after go-ahead. Five aircraft would be used for flight testing. The twentieth aircraft would be delivered in less than five years. Program cost was estimated to be $205 million in 1958 dollars. 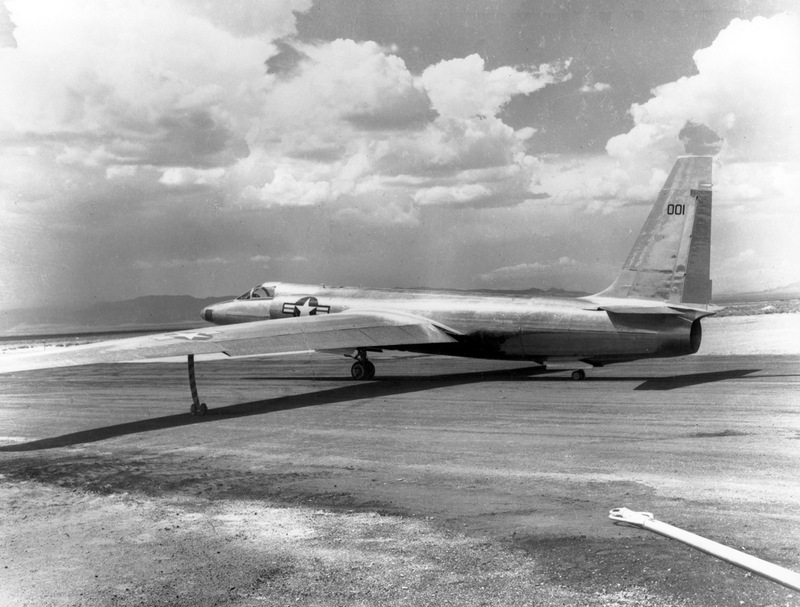 These costs did not include the dedicated B-58 aircraft needed for the program. The Lockheed A-3 was Convair’s competition for the U-2 replacement for the November 1958 Land Panel review. The A-3 was an unstaged (not a parasite) aircraft that cruised at Mach 3.2 at 95,000 feet. Two inboard JT12 turbojet engines took the A-3 to supersonic speed, at which point two forty-inch diameter ramjets at the wingtips accelerated it to cruising speed. The JT12s burned JP-150 fuel, while the ramjets burned boron-based high-energy fuel. The A-3’s design length was 62.3 feet. Wingspan was 33.8 feet. Height was 14.6 feet. Gross weight at takeoff was about 30,000 pounds, which included 18,000 pounds of fuel and 250 pounds of payload in the nose. The operating radius was 2,000 nautical miles. The pilot flew in a full pressure suit in a cockpit pressurized with nitrogen. The Land Panel favored the Convair design, which had a significantly smaller radar cross section than the Lockheed A-3. On 22 December 1958, Convair was given the green light to continue the development of FISH and to plan for a production program. A follow-up review was performed by the operations group of the Development Projects Division of the CIA in January. This review, which was based on a formal operational requirements document and specific selection criteria, came to the same conclusion as the Land Panel. Convair spent the first five months of 1959 refining the FISH design. The changes were detailed in a FISH program status review presented to the Land Panel in early June. The revised aircraft had several significant design changes. As for the design choices mentioned earlier, the refined design settled with the larger wing and the protruding canopy. However, instead of locating the canopy on the centerline, Convair offset it to the left (as the flush-mounted canopy option had been) to conform with the clearances mandated by the B-58 carrier. The single JT12 turbojet engine between the ramjets was replaced by two General Electric J85 turbojet engines located just behind the cockpit. The two engines were hinge-mounted so they could pop out of the fuselage to be used on landings. The vertical tails were relocated from the wings to the fuselage. The rear landing skids were replaced with wheels. The changes increased the gross weight of the aircraft to 38,325 pounds—about 3,300 pounds more than the November 1958 design. Range was reduced from 4,150 to 3,900 nautical miles. The overall dimensions for the new design, however, were roughly the same (47.0 feet long, 10.1 feet high, and a wingspan of 37.0 feet). In addition to refining the design, Convair conducted extensive tests for metal forming, machining, welding, brazing, heat-treating, and chemical etching on the more exotic airframe materials, including high-temperature alloys and ceramics for the wing leading edge. The company developed manufacturing processes for several full-scale airframe components—a wing box, wing leading edge, and self-sealing fuel box. Contracts were awarded for a number of major subsystems, including the navigation system, flight controls, environmental control system, turbine drives, and generators. The production process was detailed on a map of the production hangar. Organization charts were populated, and employees were interviewed and screened to meet the high security requirements for program access. More significantly, Convair conducted hundreds of hours of wind tunnel testing on various models of the aircraft, including on a 1/17-scale model of FISH, on the FISH/B-58 composite, and on a variety of inlet models. Several fundamental design problems then surfaced. The drag of the FISH/B-58 composite model was higher than expected. To get FISH to the necessary speed to start its ramjet engines, the B-58 carrier required more thrust than provided by its four J79-5 engines. The FISH/B-58 composite craft also had a balance problem. The center of gravity at low speeds was too far forward. FISH, when flying on its own, also had balance and stability issues. Finally, more fuel was needed to provide the required range. The balance, drag, and fuel problems could be addressed by increasing the length of FISH by about 1.5 feet and the length of the B-58 carrier by five feet and by upgrading the B-58 to J79-9 engines. Convair proposed modifying two B-58s for the flight test phase of the program (which included three FISH aircraft). The aircraft would be created from B-58s already in the production schedule for the US Air Force. Among many other changes, the modifications included adding a five-foot section to the forward fuselage. Two other B-58s would also be designated as development prototypes for a B-58B program being proposed to the US Air Force as a follow-on program to the B-58. Production B-58Bs would then become the primary carrier as FISH went operational. Subsequently, the success of FISH became dependent on selling the Air Force on the B-58B. While Convair prepared for production and struggled with aerodynamic issues, Lockheed pursued its own design efforts on a high-speed, high-altitude reconnaissance platform. During this period, the CIA also tasked Lockheed with designing its own B-58 parasite as a check on the performance predicted for FISH by Convair. Lockheed Skunk Works came up with two designs. One was called Arrow I; the other, B-58-Launched Vehicle. Both designs confirmed Convair’s performance figures. Lockheed’s own designs evolved from A-4 through A-11. The first three configurations, A-4 through A-6, were smaller, self-launched aircraft with vertical surfaces hidden above the wing. They weighed up to 63,000 pounds with fuel and featured blended wing/fuselages. The aircraft employed a variety of propulsion schemes that included turbojets, ramjets, and rockets. None, however, met the required mission radius of 2,000 nautical miles, leading Lockheed to conclude that maximum performance and low radar cross section were mutually exclusive. The next three configurations, A-7 through A-9, were smaller designs (44,000 pounds gross weight) that focused on performance at the expense of radar cross section. The designs had one J58 turbojet and two XPJ-59 ramjet engines. However, none of these designs could also meet the required range. A-10 and A-11 configurations were larger aircraft that also focused on performance at the expense of radar cross section. The more refined A-11 was submitted by Lockheed at the next Land Panel review. It had a gross takeoff weight of more than 92,000 pounds, which included 55,330 pounds of fuel. It was powered by two J58 turbojets with afterburners, cruised at Mach 3.2, and provided a range of 4,000 nautical miles. The aircraft was 117 feet long, 21.0 feet tall, and had a wingspan of 57.0 feet. When Convair failed to sell the Air Force on the B-58B, the carrier aircraft for FISH was dead on the design table. FISH had other setbacks as well. While the Land Panel still favored its smaller size and lower radar cross section, the CIA was concerned about the operational complexity associated with a staged design. These concerns were reinforced by Lockheed’s independent parasite studies, which questioned the reliability of ramjet engines, the minimal clearances with the B-58 carrier, and the lack of means for the pilot to eject when the parasite was mated to the B-58. Both companies were asked to submit new designs. For Lockheed, the challenge was to lower the radar cross section. For Convair, the challenge was to create an entirely new design—a self-launched aircraft that met the mission requirements. The redirection led to the Lockheed A-12 and to the Convair Kingfish. Credits: Most information for this article was derived from several Convair presentations that were released and made public in the late 1980s to support the National Aerospace Plane project. Details on the Lockheed Archangel designs came from the CIA archives (online) and from a public presentation on the history of the Archangel program by John R. Whittenbury, who contributed several drawings. 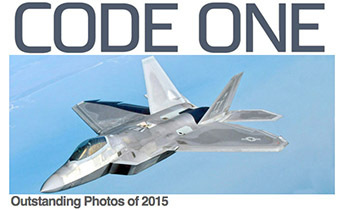 Code One sends a special thanks to Paul Suhler, author of From Rainbow to Gusto: Stealth and the Design of the Lockheed Blackbird, for reviewing the article and for background information on the competition between Lockheed and Convair. Mr. Suhler’s book was published by AIAA in 2009 and is available on Amazon.com and AIAA.org. 4 October: The Soviet Union launches its first manmade satellite, Sputnik. 12 December: Maj. Adrian Drew sets the absolute world speed record of 1,207.34 mph in an F-101A Voodoo at Edwards AFB, California. 17 December: The first successful launch and flight of the Convair HGM-16 Atlas ICBM is carried out. 20 December: The first AIM-9 Sidewinder heat-seeking air-to-air missile launched from a US Air Force aircraft is fired by Capt. Joe Gordon, flying a Lockheed F-104 Starfighter. The AIM-9, still in service worldwide, was developed by the US Navy. 4 January: Sputnik 1 re-enters atmosphere and burns up. 31 January: The United States launches its first artificial satellite, Explorer 1. 4 February: The keel is laid for the world’s first nuclear-powered aircraft carrier, USS Enterprise (CVN-65). 27 February: Approval is given to the US Air Force to start research and development on the ICBM program that will later be called Minuteman. 7 May: Maj. Howard C. Johnson sets a world altitude record of 91,243 feet in an F-104A Starfighter. On 16 May, Capt. Walter C. Irwin sets a world speed record of 1,404.09 mph, also in an F-104. 27 June: A USAF C-118 Liftmaster, reportedly on a regular supply flight from Wiesbaden, West Germany, to Karachi, Pakistan, via Cyprus and Iran, crosses the Soviet border near Yerevan, Armenian Soviet Socialist Republic, and is shot down 30 km south of Yerevan. 26 July: A USAF RB-47E Stratojet flying from Iran is intercepted by Soviet fighters over the Caspian Sea 130 miles east-southeast of Astara. The RB-47 evaded the fighters and fled to safety. July: Soviet fighter planes shoot down an RB-50G US reconnaissance plane over the east coast of the USSR. 27 August: Soviet Union launches Sputnik 3 with two dogs aboard. 2 September: Soviet MiG-17 pilots shoot down a USAF C-130A-II signals intelligence aircraft over Soviet Armenia. All seventeen crewmen aboard are killed. 1 October: The National Aeronautics and Space Administration (NASA) is officially established. 31 October: A USAF RB-47E Stratojet is attacked by Soviet MiG-17 fighters over the Black Sea. The crew of three is not injured, and the aircraft returns safely to base. 7 November: A USAF RB-47E Stratojet is attacked by Soviet MiG-17 fighters east of Gotland Island over the Baltic Sea. The crew of three is not injured, and the aircraft returns safely to base. 17 November: A USAF RB-47E Stratojet is attacked by Soviet MiG-17 fighters over the Sea of Japan. The crew of three is not injured, and the aircraft returns safely to base. 27 November: Soviet Premier Nikita Khrushchev demands withdrawal of troops from Berlin. 22 January: Capt. William B. White sets a record for the longest nonstop flight between points in the US as he flies an F-105 Thunderchief 3,850 miles from Eielson AFB, Alaska, to Eglin AFB, Florida, in five hours twenty-seven minutes. 6 February: The Air Force successfully launches the first Martin XSM-68A Titan ICBM (later redesignated HGM-25A Titan). 12 February: The last Convair B-36 Peacemaker bomber is retired from Air Force service. The retirement leaves the Air Force with an all-jet bomber fleet. 2 April: The names of the seven Mercury space program astronauts are announced from a field of 110 candidates. 20 April: The prototype Lockheed UGM-27A Polaris sea-launched ballistic missile, or SLBM, successfully flies a 500-mile trajectory in a US Navy test. 3 June: The first class is graduated from the US Air Force Academy. 16 June: A US Navy P2V Neptune is attacked by a Soviet-type MiG over the Sea of Japan eighty-five miles east of Wonsan, North Korea. One crewmember is seriously wounded, but the aircraft returns to its base in Japan with all crewmembers aboard.